George Robert Richardson was born at Sydney on 6 September 1874, son of Thomas Henry Richardson and Mary Caroline Smithson. In 1907 he married Violet Edith Rosamund Bowman at Redfern. There were two daughters and a son of the marriage. He died at Northbridge on 9 October 1963, aged 89 years. Violet Richardson died at Northbridge died on 15 August 1965. 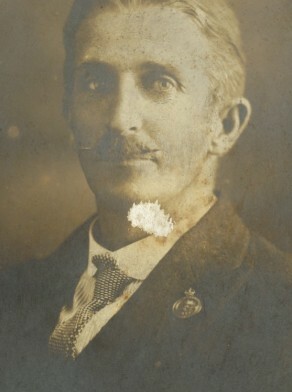 Richardson was appointed to the Australian Rifle Regiment in 1904, and made Lieutenant in 1906. He was promoted to captain. He enlisted for World War 1 on 5 May 1915, embarked on the Euripides on 10 May 1915 for Gallpoli and returned to Australia on the Karoola on 4 December 1915. Before and after the war he worked as a commercial traveller. Glebe people responded enthusiastically to the call to arms with house to house collections for the Patriotic Fund. But towards the end of 1915 local people had a glimpse of the grim reality of war when soldiers with deep physical and mental scars were invalided home from Gallipoli, to be hospitalised at Glenwood, 57 Hereford Street, formerly owned by William Cary and taken over by the Red Cross for use as a hospital. George Richardson experienced the grim reality of war, returning to Australia wounded late in 1915 to resume his seat on Glebe Council.Pageants, processions and celebrations as well as house to house collections became a feature on the Glebe landscape throughout the war. Returned men in September 1916 received a rowdy public welcome travelling in decorated cars. But the conscription referenda divided the community, and their defeat heightened tensions. At the end of the war local people took the initiative and completed a memorial to honour their 174 citizen soldiers who died in 1922.